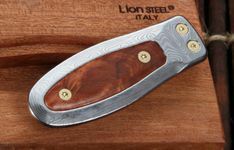 We are a Lion Steel Authorized Dealer. 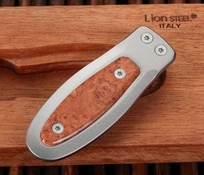 Lion Steel Money Clips are the perfect gift solution for anyone trying to find just the right fit for the man who has everything. With five different designs, these money clips all have the subtle elegance any man will appreciate. And priced at an affordable cost that you will appreciate. Here is a general description of each of these high quality money clip wallets. Briar wood and titanium: This 2 3/4" clip comes with a stainless steel tension spring that will keep bills and cards in place. At just 5 ounces, this item shows off a fabulous titanium frame inlaid with figured briar wood, worked to a perfect finish. Carbon fiber and titanium: A sleek 2 3/4" clip weighing a mere 5 ounces, this Italian money clip is built to last forever and look good doing it. The rugged titanium frame sports a durable black carbon fiber inlay and comes with a beautifully designed wood display. Damascus steel and carbon fiber: At 7 ounces, this 2 3/4" clip is made of stainless Damascus steel in the frame and holds a black carbon fiber inlay to add a bit of style to this magnificent piece. Damascus steel and Briar Wood: The stainless Damascus steel frame holds a stainless steel tension spring and comes inlaid with a perfectly finished piece of Briar Wood to compliment this original design. 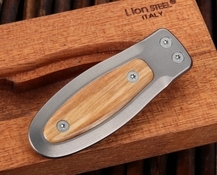 Olive wood and titanium: Shipped in an appealing wooden display, this piece is offered for those who like to travel light. 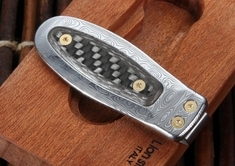 The same 2 3/4" and five ounces as most of our other clips, this one is inlaid with a well grained meticulously finished inlay of Olive wood.